Written by Lucie Mascord, Natural History Conservator, and NatSCA Committee Member. Through August to October this year, NatSCA ran its very first competition. Running up to the Caring for Natural Science Collections one-day conference at Oxford University Museum of Natural History (on 17th October 2018), the competition asked participants to post natural history conservation themed photographs to Twitter with the hashtags #NatSCAConservation and #photocomp. 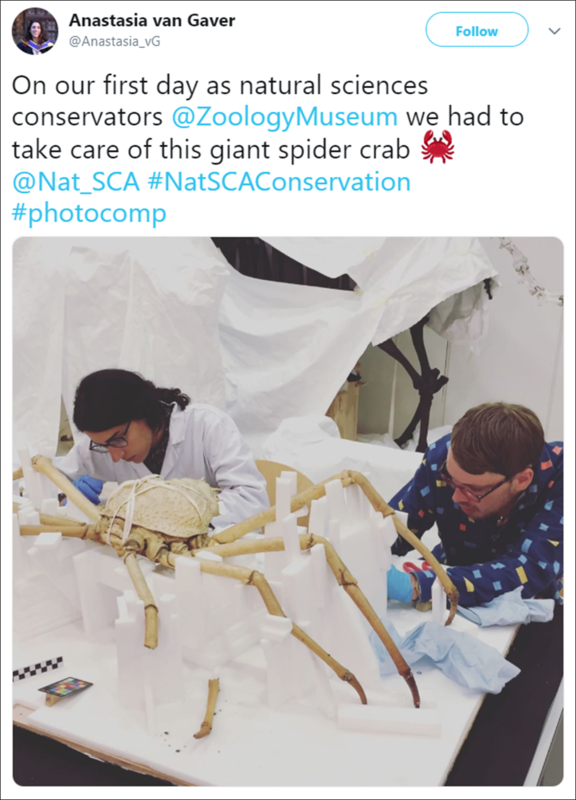 Whilst it took a little while to warm up, buoyed by some fantastic images posted by the NatSCA conservation working group, we received some excellent entries, resulting in a close competition for first place. The entries ranged from geology to taxidermy, from the humorous to the technical. This was the exact response we were looking for, illustrating the variety and accessibility of conservation. When it came down to it, the winning photograph was an excellent composition, highlighting the complexities of conserving an unusual object. The winner is this fantastic entry from Anastasia van Gaver, which features Anastasia and her colleague Samuel Suarez Ferreira on their first day at work at the Museum of Zoology, University of Cambridge, (@ZoologyMuseum), image taken by Natalie Jones. Talk about being thrown in at the deep end with this monster of a giant spider crab. Both Anastasia and Sam attended the conference in October and gave talks on specific conservation experiences during their contracts at the Museum of Zoology. To be able to spotlight emerging professionals working with natural history collections was one of the main achievements of the conference and competition. The winning entry from Anastasia van Gaver, Natalie Jones, and Samuel Suarez Ferreira. © Museum of Zoology, University of Cambridge.